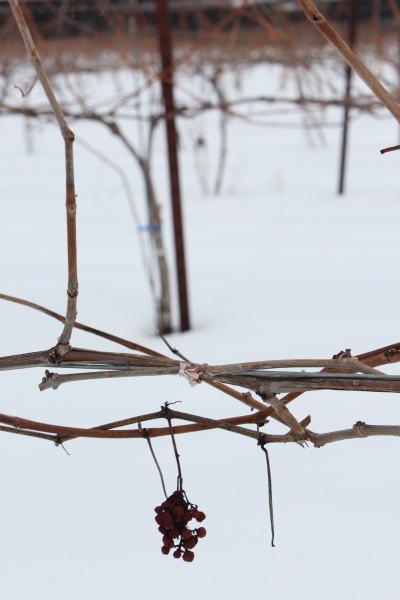 While a vineyard tour evokes thoughts of warm Mediterranean winds in the Tuscan hills or the hot Burgundian summer sun, in Meaford, you can tour our local winery all winter long. Next Saturday, Coffin Ridge Winery is offering a tour behind the scenes of the production facility, and then you can learn, hands-on, the gentle vintner’s art of hand-pruning the grape vines. Dress for the weather, and bring along a pair of pruning shears. Then after your intimate communion with the vines from whence the wine was born, you can enjoy the actual stuff. Head inside the elegant tasting room for a glass of wine and a delicious vintner’s plate. The event is $30 per person and space is limited to 20 people, so reserve now. 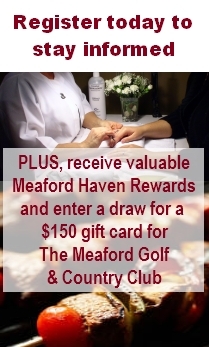 Email willow@coffinridge.ca to make your reservations. After visiting the Creemore Springs village brewery and sampling the unique maple mellowed warmth of Collingwood Canadian Whisky, it’s time to return a little closer to home for a visit the uniquely local wines and ciders available just down the road. We’ve already introduced Thornbury Village Cidery and the delicious Thornbury Premium Cider. But there’s another new winery in the Southern Georgian Bay area, and like Coffin Ridge, it’s less than 15 minutes from Meaford Haven. Back in 1998, founding partners Robert Ketchin, Murray Puddicombe and John Ardiel began conducting tests at four sites in the area to determine the best locations for a vineyard and which viticultural methods and grape varieties would prosper in the Georgian Bay region. In 2004, they planted a five-acre commercial vineyard on John Ardiel’s farm on the west side of the Beaver Valley, and eight years later, the estate-managed vineyard is producing more than 12 tons of grapes a year. Three years after those first vines were put in, the team planted a little more than 12 acres of vinifera and hybrid vines at Victoria Corners, just southwest of Sideroad 21 and Grey Road 2 near Ravenna. They harvested the first full crop there in 2010. 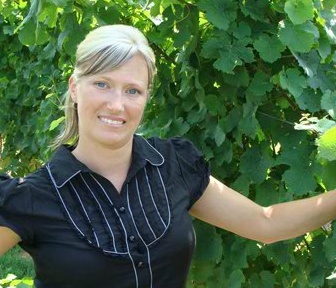 Vanessa McKean talks about a Georgian Hills white with a visitor. Plan your visit for the afternoon any day except Monday and Tuesday. The cozy cottage tasting room at Victoria Corners is open from noon to 5 p.m., and you can sample the wines (and buy your favourite), while enjoying a view of the vineyard set among the rolling hills, with the glint of Georgian Bay in the distance. 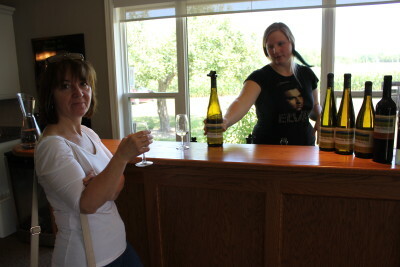 We heard that Meaford’s Coffin Ridge Boutique Winery was having a special event this weekend. Konrad Ejbich, CBC’s resident wine guru, will be at the Winery this Saturday to celebrate the release of the 2010 Sparkling Pear. He’ll share his expertise on various food and wine pairings, and you’ll be able to ask him any wine related question you like. 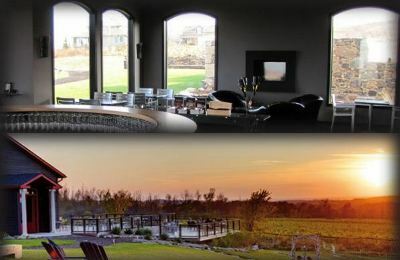 If you’re scratching your head and muttering, “A winery in Meaford?” this event might be just the thing you need to discover just what’s happening at this beautiful little location set into a slope overlooking rolling hills and Georgian Bay . 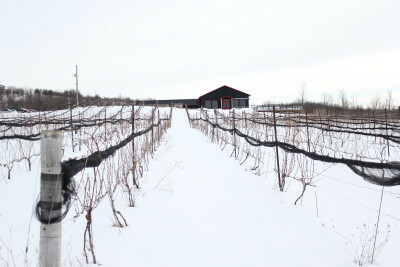 Using unique varieties of grapes that survive under winter’s deep blanket of snow and thrive in the long warm summers, Grey County’s first winery is making itself known both locally and in the international world of wine. Most recently, Coffin Ridge won three medals at the Finger Lakes International Wine Competition, and you can sample these wines at the tasting bar. Later on, we’ll take a visit to Coffin Ridge and do some sampling of our own.